. Yamanashi Folk Art - 山梨県　. 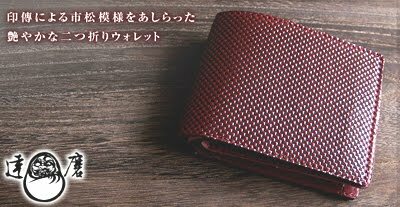 a government-designated "Traditional Crafts of Japan"
Only produced in Yamanashi, inden are goods made from deerskin with designs in Japanese lacquer. Inden has its origin in the leather accessories that were brought from India in the early Edo period. By late Edo, production had begun on coin purses, waist sashes, cigarette holders and so on. 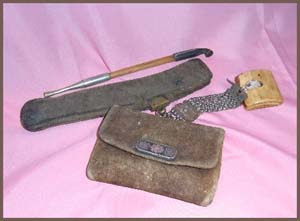 Nowadays, modern items such as purses, wallets, card holders, handbags and belts have been added to the variety of goods available. Inden production still uses its traditional methods. The Daruma Logo is only inside, for the owner to enjoy. Founded in 1582, INDEN-YA continues to create Inden, a 400-year-old form of traditional leatherwork. While Inden has been popular among a select few who were interested in traditional Japanese culture, it has garnered very little attention from the general public. Our mission was to communicate Inden’s allure and the historical nature of the brand, and to improve awareness of the INDEN-YA brand through renewal of the brand’s site. Our primary aim was to attract people in their 20s through 40s, who comprise the primary users of the Internet, and the younger generation that prefers minimalistic designs. Tonbo is the Japanese word for dragonfly. Samurais appreciated how they fly straight and preferred to use this motif for armor and ornaments. Throughout the ages, the word “hana (flower)” referred to sakura (cherry blossoms). Their ephemeral nature paralleled that of bushido (the way of the samurai) and this motif was frequently used on armor and helmets. This refers to the infinite expanse of the vast ocean. It was used as an auspicious motif to invite good fortune. This is much older. Smoke creates the patterns on the skin. Craftsmen tie deerskin around a rotating cylinder, next fix paper patterns on the leather and turn it over a smoky fire. The smoke darkens the exposed leather, thus creating patterns. It also leaves a smoky aroma that lingers even after many years of use. 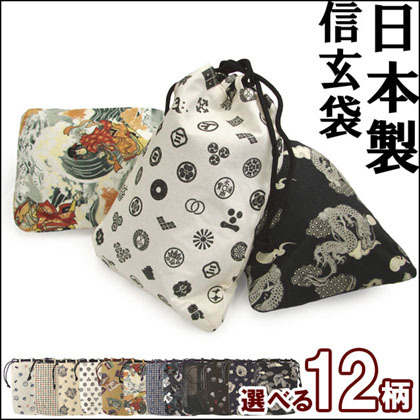 This pattern was a favorite with the samurai since the middle ages.
. shoobuyu, shoobu-yu 菖蒲湯 (しょうぶゆ) "iris bath"
The normal Samurai outfit did not have any pockets, so small pouches or bags were used to carry things. Some say that Takeda Shingen was the first to use such a bag, hence the name. The bag is made with two layers of ray-skin (untanned hide) and lined with leather. A drawstring keeps it closed. Some bags have a square bottom reinforced with bamboo or strong Washi paper. Small Clay Dolls from Kiyomizu. Set of dolls packed in a Shingen-bukuro 信玄袋.
. Takeda Shingen 武田信玄　.